I’m running another promotion through the end of September for new clients — both to spur vacation season business and to support the Baltimore Note. 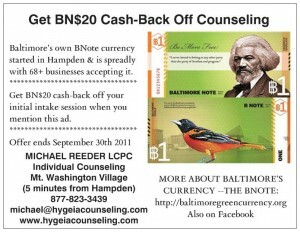 MENTION THIS AD at or before our initial session and I’ll give you BN$20 cash-back on your initial therapy session. If you are wanting to start therapy anyway, this is a good opportunity to get acquainted with the 68+ local businesses that accept the BNote. There are over 140 businesses participating at this point!